Good vintage cue, classic design and a neat bicompax layout. The pump pushers, hands and crown are well executed and the overall dial layout looks good. Robust movement with 60 hours power reserve. Dimensions are leaning on the large side, with a thick tachymeter. A thinner profile would be preferred. 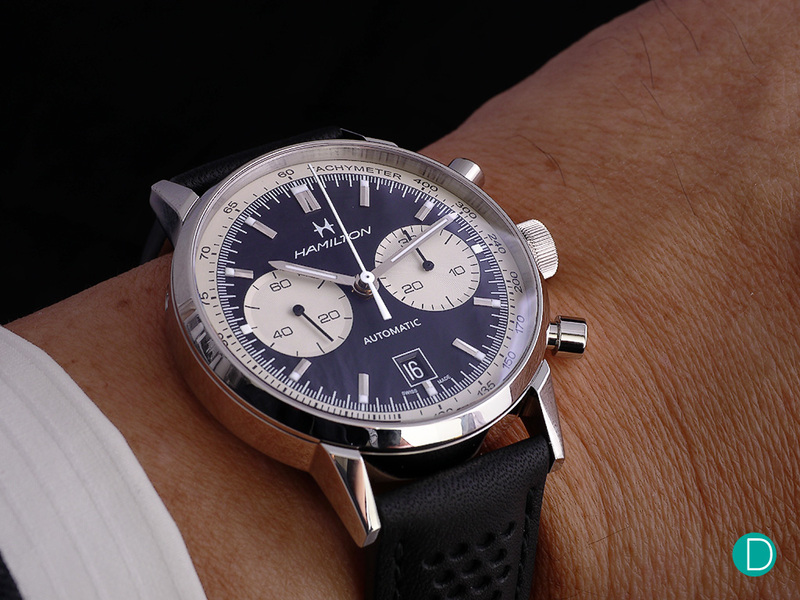 So how do think this Hamilton Intra-matic 68 Autochrono fares in this retro-esque Basel year? 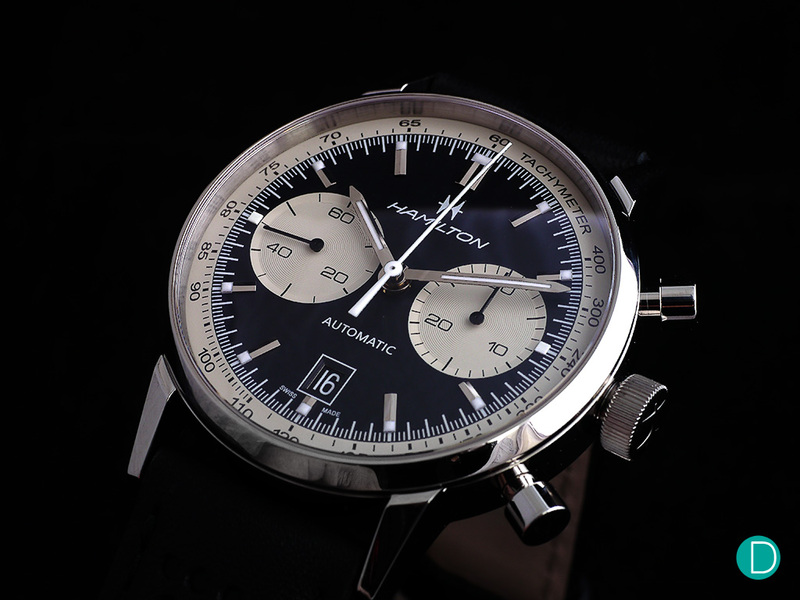 The new Hamilton Intra-matic 68 Autochrono Limited Edition a “re-edition” based off the vintage Chronomatic. The watch is sized at 42 mm, cased in stainless steel and is pretty thick. It comes complete with a closed caseback with a circular H monogramming fashion. Similarly styled to the original, it takes on design cues from the 60s, with tapered lugs and pump pushers. The crown is embossed with the old-school H insignia, also seen on the dial. The watch is fit with a domed sapphire crystal instead of a raised one, which many brands are using for the plexi glass effect. Perhaps due to the already super thick (relatively speaking) case profile, adding a raised dome crystal will add to unnecessary heft. Although, having plexi glass on a slim vintage chronograph, preferably manual winding, with column wheel actuation, is the real reason for living isn’t it? 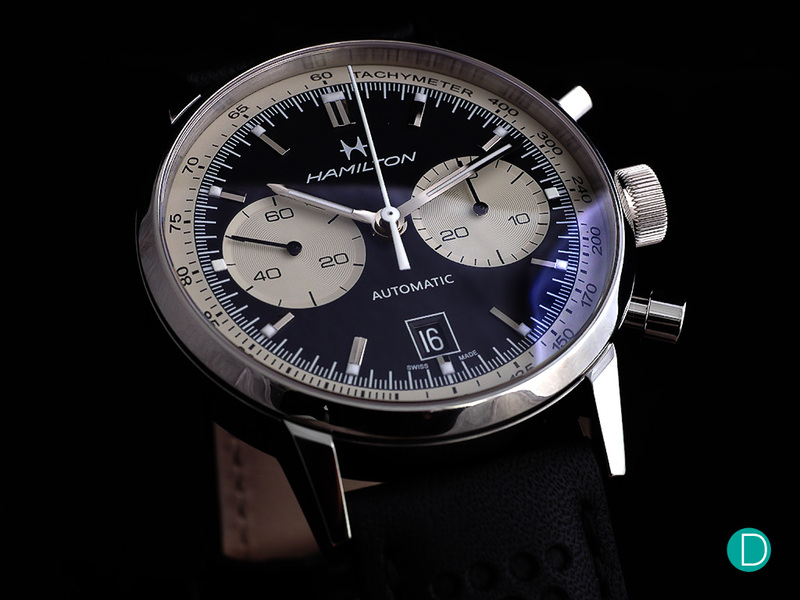 The Hamilton Intra-matic 68 uses a sapphire crystal glass, a stainless steel case, and measures 42 mm in diameter. The dial looks great. Well designed, accurately replicated font in the spirit of the original, with a nice reverse panda configuration. Though having seen the Longines Heritage monopusher collections over the last couple of years, competing against that high benchmark will not come easy. The layout is as expected of a bicompax configuration, well balanced, and traditional. The hour and minutes hands are finely polished and well contrasted with the white seconds hand. The problem with the dial however, is that it looks way too wide. Probably due to the size of the watch versus the movement, the dial has a pretty thick periphery tachymeter ring. The caseback says, “Hey look, this is a Hamilton!”. Just in case you misread, here’s a thousand Hs. Perhaps too comical, and in an unfortunate or fortunate association with another H brand, one remembers a more flamboyant and flashy brand association rather than a portrayal of class or subtlety. Even if not for subtlety, some tool watch inspiration would say no to giant Hs or Is. Though some reviews have said, it was a good thing to hide the modified 7750 instead of a see-through caseback, one could only wish that the caseback was designed as tastefully as the dial side was. For instance, a snap on brushed steel caseback, with just the numbering, x/1968. How classy that would look… But that’s just an opinion. The Hamilton uses an automatic eta-based caliber H-31 with about 60 hours power reserve. 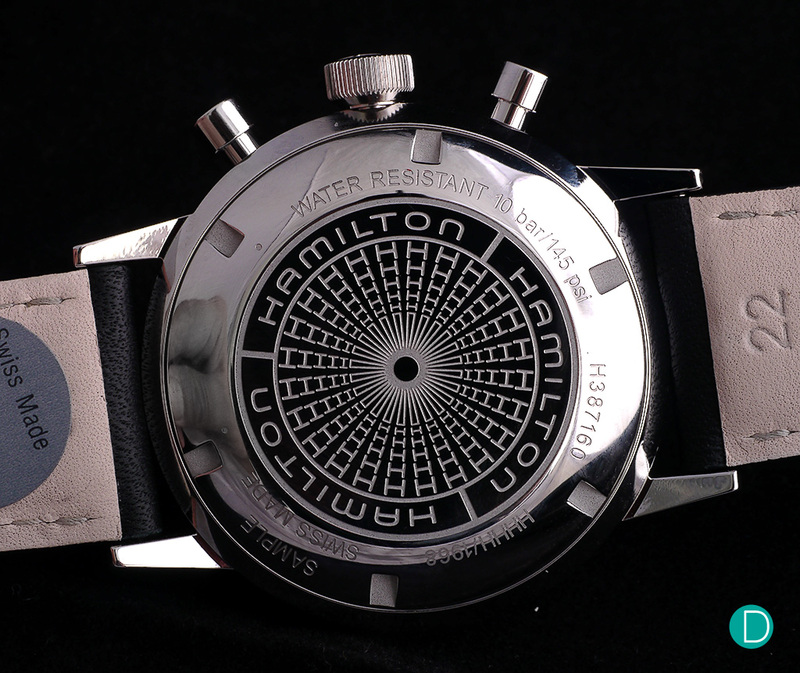 The Hamilton uses an automatic eta-based caliber H-31 which has about 60 hours of power reserve. A workhorse movement, usually found in brands who do not have their in-house calibers, its main shortfall is its thickness. Apart from that, the caliber is an ideal choice for a watch in this price range. The Hamilton comes complete with a race themed perforated leather strap. 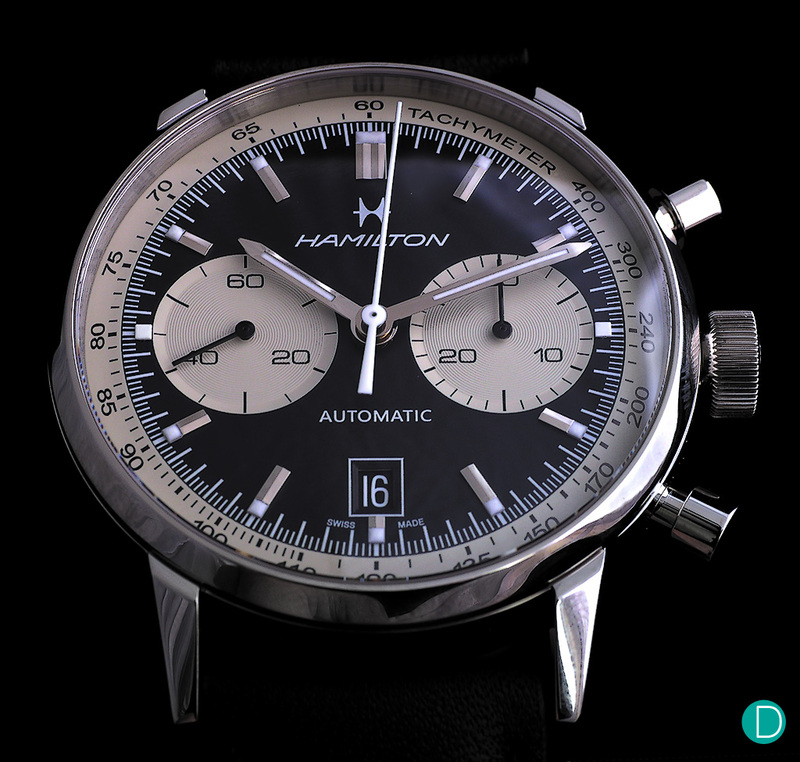 Hamilton’s intra-matic 68 looks good, and gives its fans a chance to re-live the 60s watch aesthetic without taking the risk of vintage watch buying. It is a limited edition of 1968 pieces, if limited editions still mean something to some; and has a good looking dial. In particular, the large crown and pump pushers provide the definition to the watch’s silhouette, and the overall design of the watch is applaudable. However, one wonders, if the Hamilton will still stay in the shadows when pit against the more popular mid range brands, and their remakes. The Heuer Autavia, Longines Heritage and also Tudor’s latest diver’s chronograph. Perhaps instead of competing with a similar design in a head on competition they could have opted for a long-tail strategy like what Rado did with the Captain Cook. Go small and slim for a men’s diver, with an 80 hour power reserve, raised dome sapphire and ceramic bezel. Limited edition as usual, but within the interesting yet affordable category.